I love the decor of the hotel. Very chic. You almost feel like you are in Morocco (well, almost…). It’s always time for a Cosmo! 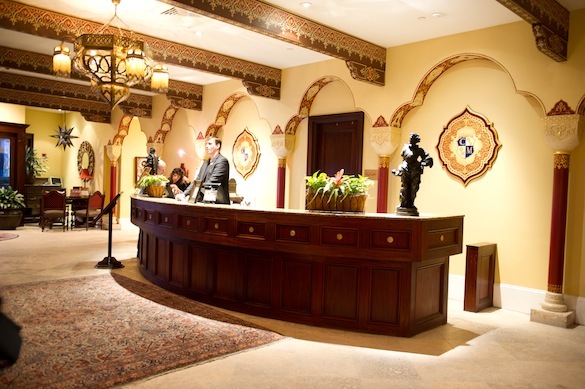 This beautiful and historic hotel was built in 1888 and was originally called Casa Monica, named for St. Monica, the mother of revered St. Augustine and namesake of the city. 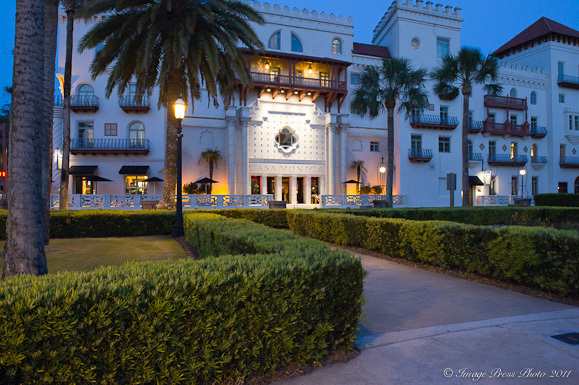 A short time later, the hotel was sold to Henry Flagler and was renamed Hotel Cordova. 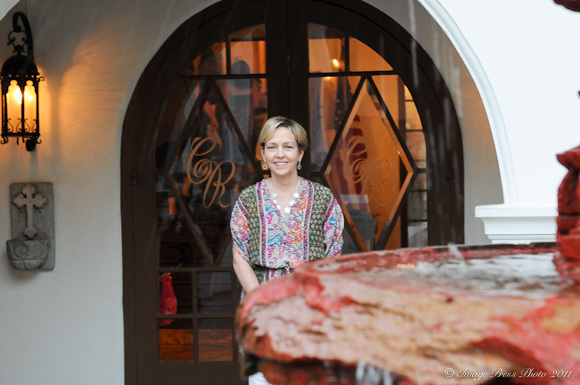 After thriving for many years, the Hotel Cordova closed its doors in 1932. 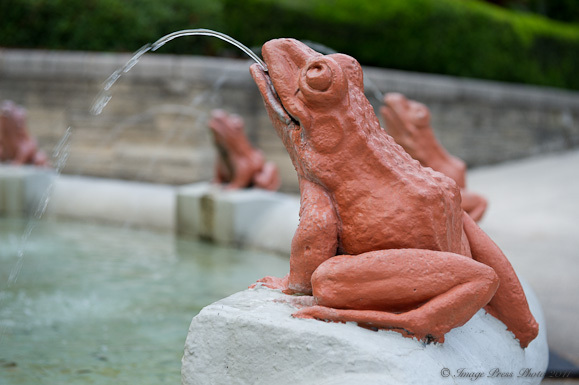 Thirty years later (in 1962) it was purchased by St. John’s County to be turned into a county courthouse. The property remained a courthouse for another thirty years prior to being purchased by The Kessler Collection in 1997. The Casa Monica Hotel was restored to its original splendor in 1999 and was reopened with its original name. Do you think because this hotel has such a long history that it could be haunted? Well, I have read where it just might be. We keep staying in these haunted hotels. I really need to find a place to stay that isn’t over say…five years in age! 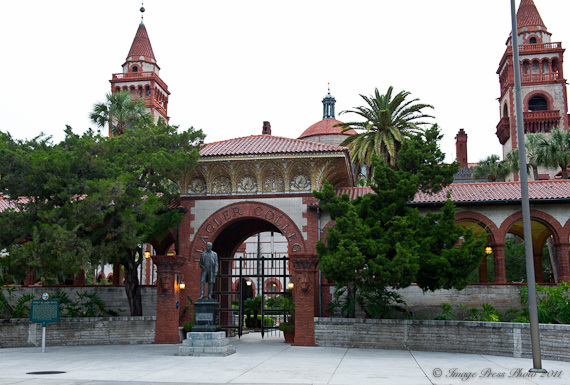 St. Augustine was founded in 1565 and is the nation’s oldest city (another good reason for ghosts and goblins!). It was settled by Spanish Admiral Don Pedro Menendez de Aviles by the order King Phillip II of Spain. He was sent to the New World to explore and colonize the Florida territory and was instructed to drive out any pirates and non-Spanish settlers to protect the investments of Spain. Menendez arrived in Florida on August 28, 1565, the Feast Day of St. Augustine. 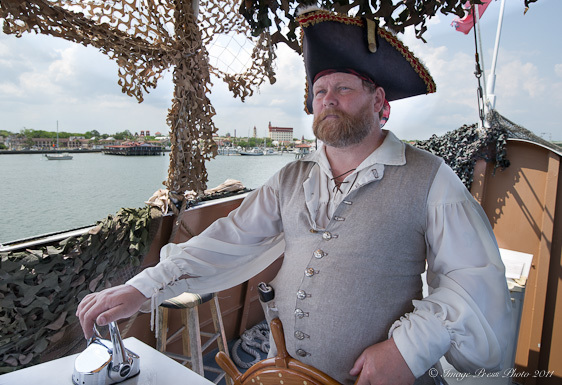 Menendez didn’t drive out all the pirates! We went sailing with some. There were great photo ops at almost every corner. 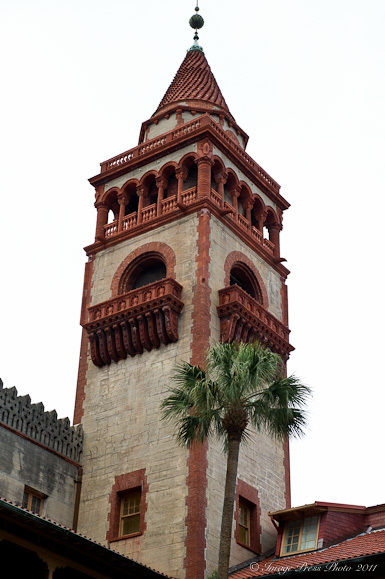 There is beautiful architecture throughout St. Augustine. Too bad we had such a short stay. 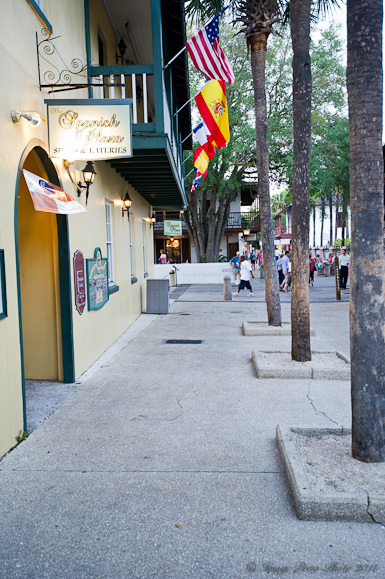 There are charming streets everywhere in St. Augustine. We had dinner at the Columbia Restaurant for a little bit of Spanish food. What a pretty school to attend. 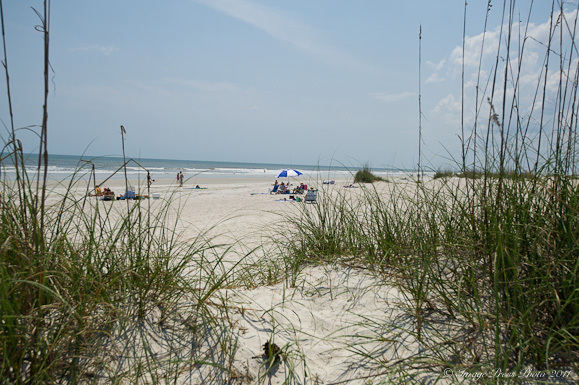 Life’s a beach in St. Augustine! 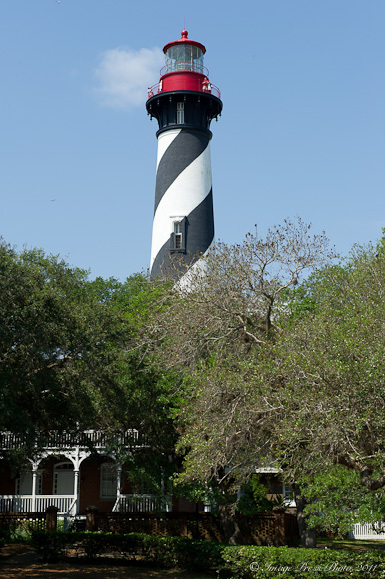 There are stories of ghosts relating to the St. Augustine Lighthouse & Museum and they have been featured in television shows, books, and local lore for decades. 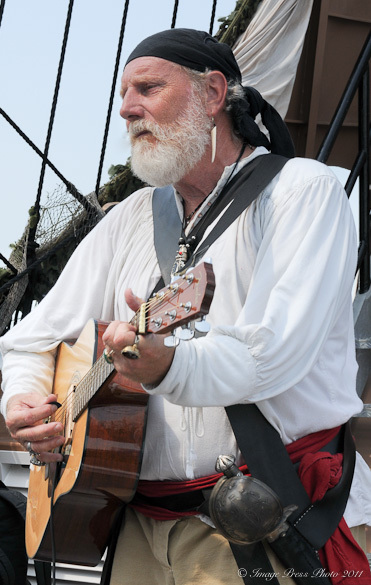 The oldest city and port in the nation combined with pirates makes for great ghost stories! Another haunted city…oh, my! There is something spooky about this place too! 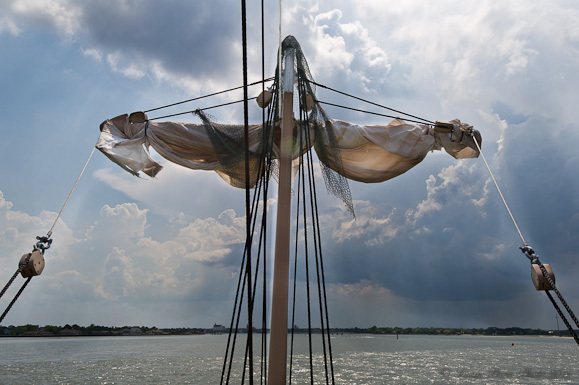 Since pirates have been a large part of the history of St. Augustine, we decided that our trip to the city would not be complete without a pirating adventure on the Black Raven! Arghh! Don’t you love the pirate in training? 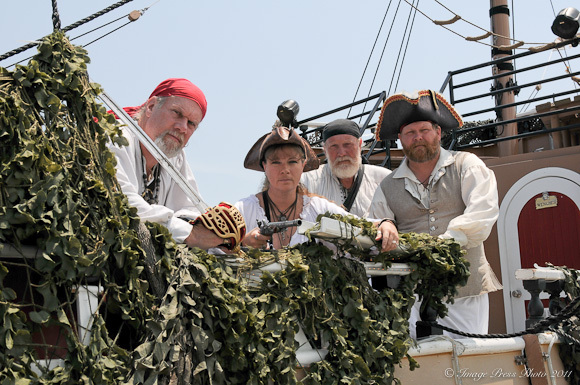 Everyone gets into being a pirate while on board the ship! 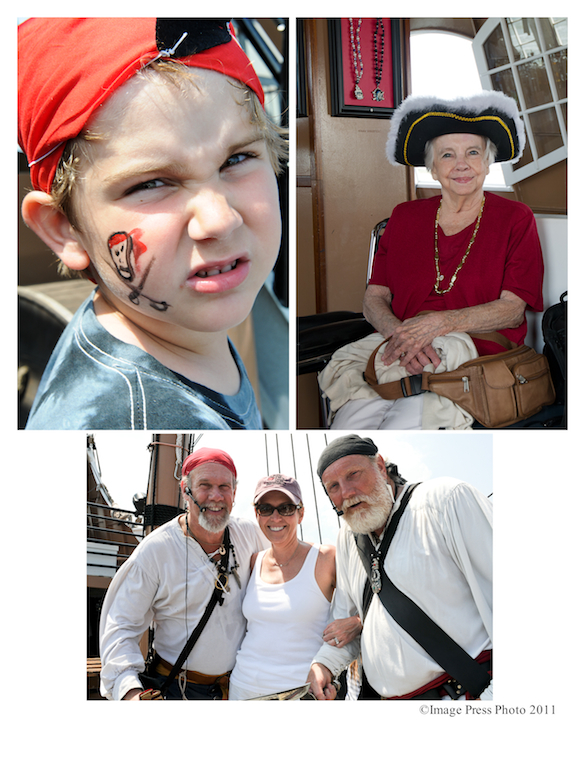 Everyone is a pirate on the Black Raven! There was a storm brewing at sea. They sang that annoying “It’s a Pirates Life for Me” song. I still can’t get it out of my head! 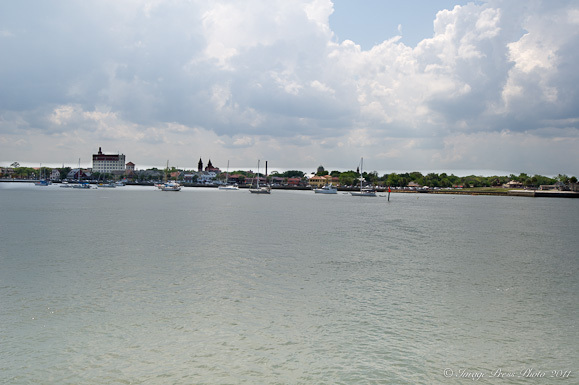 View of St. Augustine from the ship. 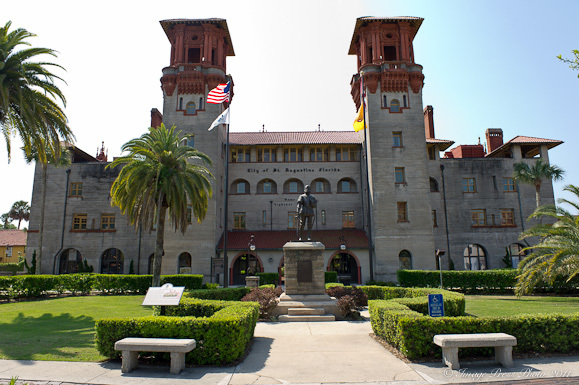 St. Augustine is a very pretty city, so I hope you get to visit someday. Be sure to stay longer than two evenings (as we did). There is so much to see. Mr. B even missed visiting the newly built World Golf Hall of Fame. I guess we will have to make another trip there soon! I have some very exciting giveaways coming this week, so please check back on Wednesday and Friday! Oh my goodness… this is just too funny. But it looks like you had a wonderful time! Sounds like you had a fun trip! I will definitely have to get my hubby to take me there someday. It looks like a really neat place. 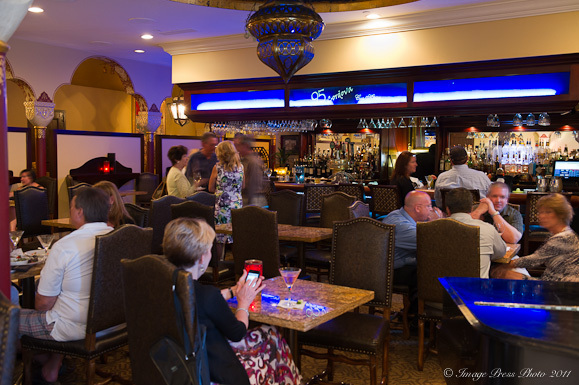 I’ve been to the Grand Bohemian in Asheville, and am absolutely in LOVE with the place!!! (And with the whole town, truth to tell!) This looks like a wonderful trip you’re on!!! We did a video shoot at the light house one year–climbing to the top a few times a day certainly works up an appetite. If anybody else is planning a trip, the Gypsy Cab Company (right down the street from the Alligator Farm) is a great casual lunch spot. I became addicted to their Cuban wrap! Love the lighthouse. I didn’t know there was one down there. Putting it on my list of places to go! what a fun trip Gwen – so glad you and Roger took the time – even if only for a day! St Augustine is a fabulous place! Your photos are beautiful. Haven’t been there in years, still looks the same. Thanks for the wonderful view. I love St. Augustine. It’s such a fun town and my favorite restaurants are Columbia and A1A Aleworks. Glad you had fun and Happy (late) Anniversary! St. Augustine is truly beautiful. We loved the Castillo de San Marcos, the old fort overlooking the ocean, and the alligator farm. Unfortunately, we were starving when we arrived, and grabbed the first food we found–we need to be patient next time and visit one of the excellent restaurants there. It’s was a pleasure meeting you. Thank you for your comment and for taking a peek at my website. We enjoyed our dinner at Di carlos restaurant very much on our last evening in Wisconsin. We also have a great time chatting with you!